After finding these this year, they have become my go-to for on the go snacking, traveling, or before a workout. Basically any time I need an energy boosting snack and refuse to compromise on ingredients and my wellness plan. Known for their packed-with-superfoods energy bar, R.e.d.d. Bar has just released Salted Caramel to their lineup (Yes, gasp!). While energy bars aren’t always considered the healthiest or tastiest option for conscious eaters, Redd’s brand-new flavor is to-die-for-delicious, and full of good-for-you ingredients that will keep energy levels even and appetites satiated. Salted Caramel Redd Bars are perfect for curbing sweet cravings—the bar has a brownie-like texture with creamy caramel with a pinch of salt to cut the sweetness, and helps avoid “hangry” by leveraging extended release energy. Redd Bars are also plant-based, non-GMO, and full of 23 essential vitamins and minerals. If you have trouble deciding on a flavor, they also have a variety pack which is perfect if you want to beg from bites from each family member. Nonnie’s Nectar is offering 10% off to my readers at checkout. Just use the code ‘CBD10’! Now before you freak out and move on to #3, these Gummy Bears are 100% THC-free and non-psychoactie. That means absolutely zero high whatsoever. I promise. Nonnie's Nectar is a family business, developed by Julie and Ryan Beers for their seizure-afflicted grandmother. Their beloved grandmother (Nonnie) was actually the inspiration behind their entire brand. Nonnie had always been interested in alternative medicine and wellness, and she was taking CBD for her ailments before most people knew about the benefits of CBD. The Gummy Bears are my go-to for gifting as they are an excellent entry-level product for those unfamiliar with CBD and its benefits, and also, the just look adorable in their cute little canister. That being said, I also use the CBD Softgels and Tincture on the reg for their anti-cancer benefits and as a sleep aid, and also use their Salve post-workout for joint and muscle pain and fatigue. Where do I even begin with these? 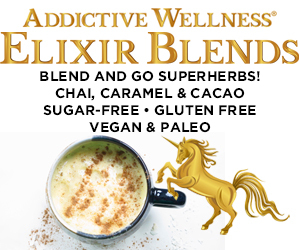 In addition to adaptogenic health and wellness benefits, these elixirs are just freaking amazing tasting. All Addictive Wellness raw heirloom, artisans, superhero elixirs are sugar-free, gluten free, GMO-free, soy free, dairy free, and nut free. The mushrooms in their chocolates and elixir blends (reishi, chaga, lion's mane & tremella) are from an elite class of mushrooms known as TREE MUSHROOMS. They affect the body very differently than conventional ground mushrooms and have been extremely well studied and researched by modern science. Mixed with hot dairy-free (or dairy) milk, or blended into smoothies, hot coffees, or baked into anything, they have become an essential part of my wellness routine. I buy 7-packs of both Caramel and Hot Cacao since I can never decide. Stasher Bags in and of themselves are BRILLIANT. Their founder created them to reduce plastic waste in the environment, and they can be microwaved, frozen, run through the dishwasher, and probably survive a nuclear attack, all without releasing harmful toxins and BPAs into your beautiful human ecosystem. So this is not even two gifts in one, but many many many gifts in one both for the recipient and the planet. Two minutes later there’s a crime scene of wrapping paper on the floor and the remnants of the 2nd cup are smeared all over my mouth. Buy a 9-Pack, give a few away and make the rest a holiday gift to yourself. You’re welcome. Santa - if you do exist - I have been a VERY good girl this year. #1 The Female Brain by Louanne Brizendine, M.D. Drop everything and read this book. Seriously. Every single person in the world needs to read this book. A riveting science-based but approachable read that I picked up and couldn’t put down. Men, women, fathers, mothers, daughters, sons, sisters, brothers, young and old. This New York Times bestseller has been translated into more than thirty languages, has sold nearly a million copies between editions. Its profound scientific understanding of the nature and experience of the female brain continues to guide women as they pass through life stages, to help men better understand the girls and women in their lives, and to illuminate the delicate emotional machinery of a love relationship. Get 15% off your entire order with the code ‘HEALTH15’. The Healthy Human product line is actually quite versatile, with a collection of insulated Stein’s and Tumblers in every size and color imaginable. But this 32oz Stone White Stein is just a true beauty and there is no one on the planet (who isn’t a complete sociopath) that would not be absolutely delighted with this gift. I do not leave the house without this stein. I once though I lost it, and I was more upset than if I had lost my phone (I never said I was a reasonable person). I assure you that the recipients of this gift will be as equally thrilled as I was, although they are probably normal and would feel more attached to their phone. Or actually to other human beings. The insulation in the Healthy Human line of products is truly revolutionary - with hot drinks staying hot for 12 hours, and cold drinks staying cold for 24 FREAKING HOURS!!!! Born in Charleston, South Carolina, Healthy Human was created in 2014 when the founders were struggling to find alternatives to environmentally unfriendly and unsafe water bottles. They wanted something that was easy to carry, didn’t sweat or retain flavors and, most importantly, was safe to use. Also, they are offering my readers 15% off your entire order with the code ‘HEALTH15’. To say I’m obsessed with one of the latest products from Vital Proteins is an understatement. I add this into coffee every single day (on canister #3 since its launch. This makes coffee insanely creamy, tastes uh-MAZING, and also beautifies hair and skin with 10g of collagen per serving. It’s a versatile baking ingredient, and you can use it to make these anti-anxiety chocolates for the holidays. This should be on your list for friends and family, and make sure to get yourself some too! Vital Proteins has also just launched a Collagen Matcha for your matcha latte loving friends and family members! Use the code ‘RH15’ for 15% your order total at checkout! Another product I have added into my wellness routine EVERY DAY since discovering this year. Each one has unique health and wellness benefits, and when used in conjunction promote vitality, longevity, fight cancer, improve brain function, and if you need a good nights sleep, Reishi is a MUST. If you and your loved ones haven’t incorporated adaptogens into your wellness routine yet, Chaga - “the king of mushrooms” - is a great place to start. I blend these into smoothies, bake into baked goods, mix into energy bites…Each of these roots and mushrooms are of the highest quality, carefully sourced and hand-shipped by proprietor Alyssa Melody. If that’s not enough, the code ‘RH15’ gets you 15% your order total at checkout! Use the code 'RHMOON15’, and 15% will get taken off of your entire order at checkout! A pure, easy, and indulgent way to experience the world's most revered ingredients. Inspired by ancient wisdom, Moondeli blends are delicious swirled into nut milks, smoothies, coffees, teas, juices and other delicious wellness recipes. Our ingredients are always vegan, organic or wildcrafted, andethically-sourced. The Golden Turmeric blend is an fragrant and delicious way to combat pain, inflammation and to aid post-workout recovery. Bliss Booster is a must-have for chocaholics or anyone looking for an energizing, chocolatey mood boost in their day. Their Mini Set is beautifully packaged, and my go-to gift for those newly foraying into wellness. This is the most beneficial skincare product I have ever used EVER, and it’s totally off the radar. I myself don’t have acne except for the occasional hormonal pimple, but until use of this product, could never get my dry skin to look radiant. After just a few days of using this, your skin will literally GLOW! And the proprietor Amy Le developed this nourishing skincare solution after suffering herself from adult-onset acne. Determined to find a solution beyond prescriptions and medications, she began to seek out and test various products. She was looking for skincare that was safe and effective. She wanted to eliminate her acne and start her skin down a healthier path. After years of frustration and little progress, she finally decided to formulate her own solutions. 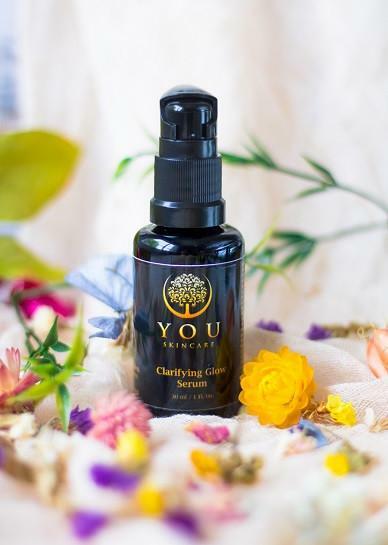 I pair this with the Hydrating Glow Face Oil for absolutely radiant results, without chemicals, and while supporting a small female-owned business. By far the most innovative way to get your coffee fix on the go, and also for sure the most beautifully packaged. Copper Cow’s convenient technology of our Portable Pourover filters makes brewing a fresh cup of coffee easy anywhere. No additional equipment is necessary; you just place the filter over your cup and add hot water. Copper Cow Coffee is a woman and minority-owned and operated company founded in 2016 by Vietnamese-Calfifornian Debbie Mullin. Their specialty coffee is sustainably sourced from the highlands of Vietnam, and they travel far and wide to find the perfect flavor and responsible sourcing of the best coffee Vietnam has to offer. Each coffee filter comes with the cutest little packet of condensed milk, essential to a traditional cup of Vietnamese coffee. The Copper Cow milk + sugar portables are the only shelf-stable cream & sugar that contain no additives or chemical preservatives. Just milk and sugar on the road, no refrigeration required. This was my go-to gift for foodies, coffee lovers, or just for friends who appreciate the beautiful and unique. Make sure to get one for yourself! Copper Cow Coffee is also available in over 1000 retail locations including Williams-Sonoma, Whole Foods, Cost Plus World Market among others.